The two have similar playing styles, and two very different pasts — but rookie senstation and newest member of the Washington Redskins, quarterback Robert Griffin III, has an incredibly high opinion of Michael Vick. During an interview with NFL Network, RG3 sung high praises for Vick, and especially his return to the NFL. For those who watched any Baylor football, RG3’s respectful comments are no surprise. The kid is all class and for someone who is going to be playing Vick twice a year — he’s off to a good start. The two are going to be featured on multiple marquee match-ups in the upcoming seasons, and with Griffin III taking the high road, it will be interesting to see how Vick responds. 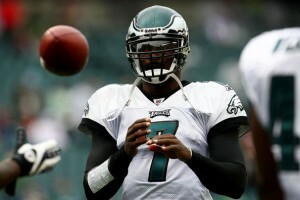 As Sheil Kapadia of Philly.com noted, Vick seems to have an immense amount of respect from his peers, despite his past. It is some sort of paradox, as most fans around the NFL outside of Philadelphia hate him, but his fellow players adore him. RG3 may still be playing the role of the rookie who is star-struck, but his comments hold more water than most would think. and i throw barkley in that overrated west coast sissy qb club…he will never be a quality starter n nfl!! far superior talent is padding his stats…when he plays notre dame of all teams he looks avg…much like leinart & sanchez…no excuse that theyre still given this pass…fyi…i called ponder as first rounder…not mcshay or kiper….14th pick!